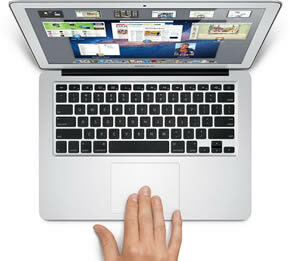 Apple is planning to launch new MacBook Air models in the first quarter of 2012. The Air will be available in 11.6-inch, 13.3-inch and 15-inch panel sizes to compete directly with PC-based ultrabooks, according to information gathered by DigiTimes from upstream supply sources. Sources also indicate that upstream players have already started early production runs of the new MacBook Air models and that the 15-inch Air will directly compete with ultrabooks. Apple will likely begin to drop prices on existing Air notebooks in their retail stores and online leading up to the refresh to move existing inventory. Third party retailers like Best Buy have already slashed prices on the Air lineup. The 11.6-inch model with 64GB of storage is selling for $939.99, a $60 savings off the regular price. The 13.3-inch unit with double the storage capacity is $65 cheaper than normal. Prices could drop even lower as Q1 2012 approaches. It’s unclear what other changes Apple has in store for the MacBook Air refresh. The company updated the Air lineup during the summer by adding Thunderbolt connectivity, Intel’s Sandy Bridge processors and backlit keyboards on all models. The timing seems just about right as we could see as many as 50 ultrabooks on display at CES in January. Intel CEO Paul Otellini is set to give a keynote speech and officially launch the 22nm Ivy Bridge platform likely to be found in the majority of aforementioned ultrabooks. If we had to guess, the Air lineup will also get the Ivy Bridge treatment.